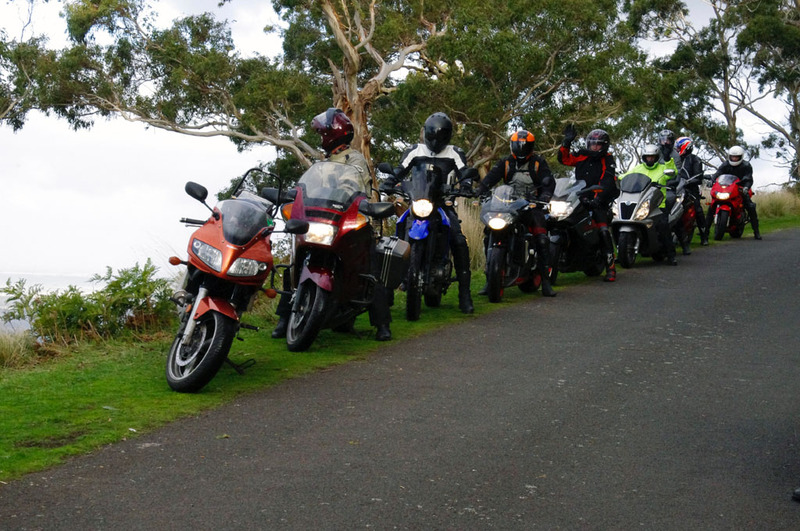 This ride report was originally published in the July 2012 issue of the Motorcycle Tourers club magazine, ‘Chain Lube’. 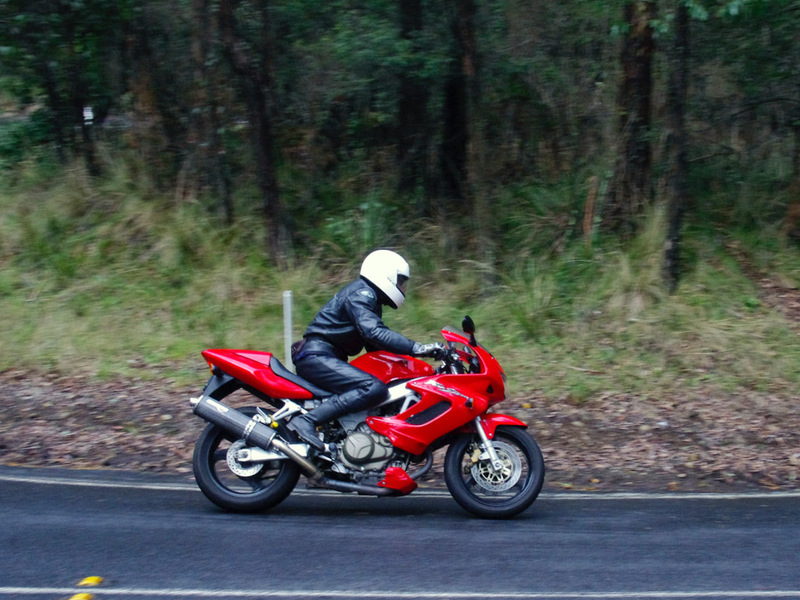 Being a club member now for 2 years and enjoying all the rides others have planned I decided it was now my time to lead my first club ride, after hours of studying maps making no sense to me whatever I decided to just head out and find the roads myself. So off I went with no direction whatsoever, I decided to concentrate on areas around the west so if I got lost I’d never be too far away from home, I was keen to find roads I had not been on with other club rides but keeping in mind all our bikers like bends and twists which was probably my biggest challenge as the west is so flat. 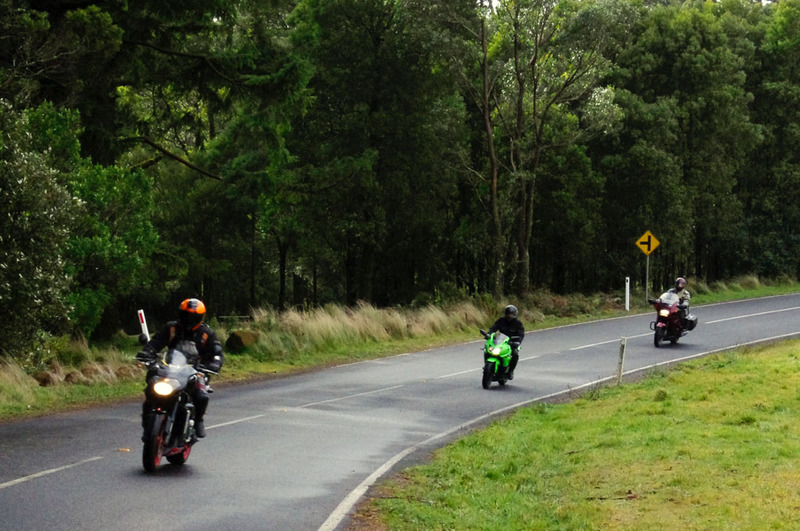 Anyway after many hours riding around getting lost and some input from some good friends I came up with my ride that I hoped would appeal to the other club members, I hope that all the members who rode along enjoyed it as much as I enjoyed planning it for you. I arrived at our usual meeting point in south Yarra at 8:45am, the morning was clear, a chilly 4 degrees but the sky looked promising for a clear day ahead. David P & Michael were there having coffee along with 3 other club members who decided to join the ride unfortunately David felt he was coming down with a cold so wisely decided not to ride along but to later join us for afternoon tea at the end of the ride, so at 9am myself and 3 other riders departed making our way over the Bolte bridge towards the aircraft viewing area which was our planned 2nd pick up point. To my surprise when we arrived there were 8 other club members and 1 visitor braving the cold & eagerly waiting to get on the road. 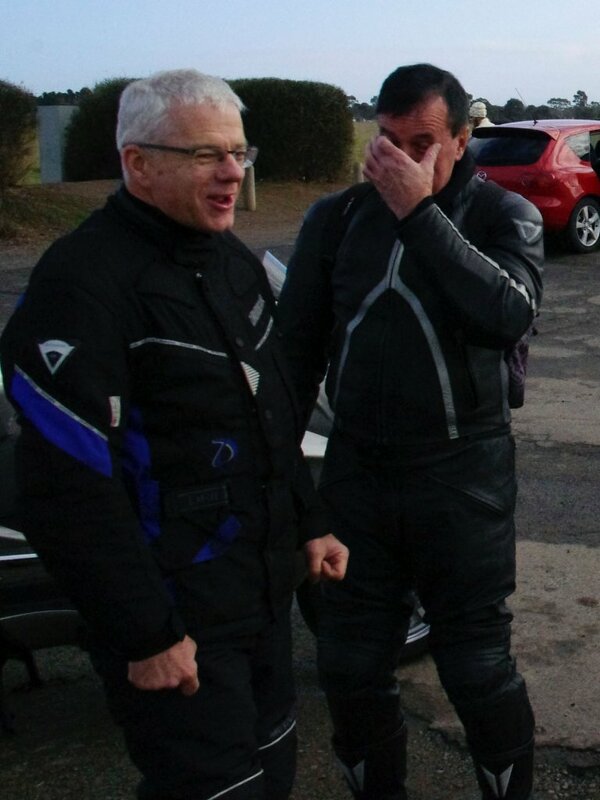 I was very pleased with so many attending so my spirits were high, I was also delighted to have one of our newer members (Ken) along for his first ride and also our visitor Paul that I’m sure everyone will meet at one of our club meetings. So it’s now 9:45am, 13 riders mount their bikes, all the heads of the people at the aircraft viewing area turn to watch as our bikes start up and the bikies leave the area and roar up the road. A bit of a boring start to the ride as we ride up the hwy though to Sunbury taking the Romsey turn off, just past Clarkefield we take a left turn at Bolinda and hit some narrower country roads with no traffic and a few bends and twists, we continued though a few small towns taking the back roads to the turn off to Mt Macedon. Now the air was getting noticeable colder and the road a bit dewy and slippery so the pace slowed a bit as we wound our way up the mountain taking some extra care as there were 2 very tight 10km corners approaching. 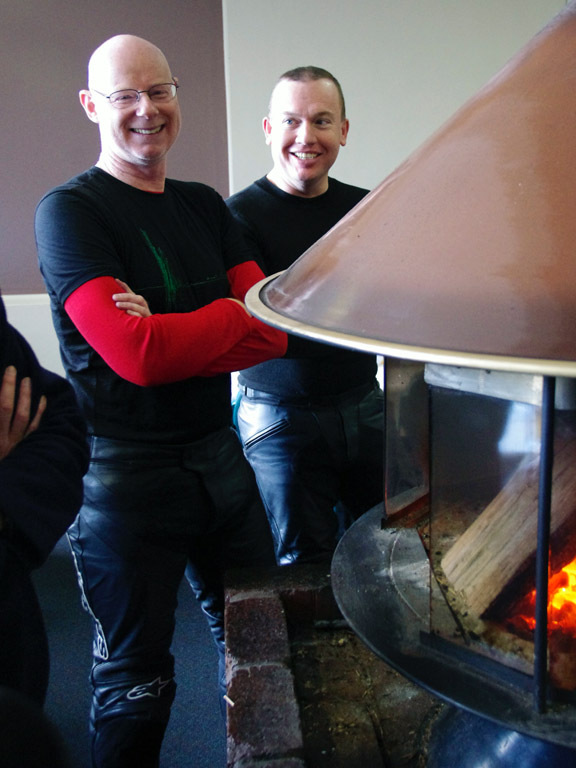 13 very cold bikers arrived at the top of the mountain keen to get into the cafe to warm up and get a hot coffee. 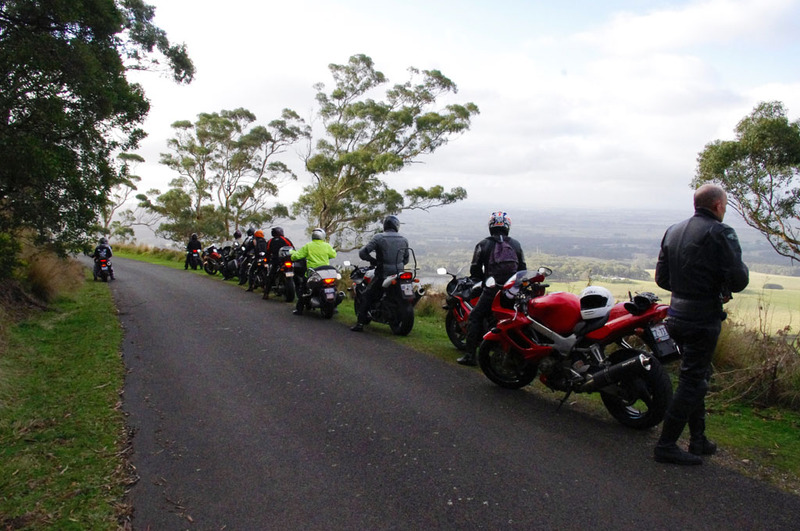 After morning tea Brett went ahead to get a vantage spot for some photos, we then all headed off back down on the same road we came up on but this time going straight ahead to Woodend at the base of Mt Macedon. We came across Brett snapping photos at the second tight 10km corner we came upon on the way up, after all the bikes had passed him he was about to get on his bike when a 4wd took the bend a bit fast and lost control skidding into the gravel on the side of the bend, the local farmer must have heard it and noticed Brett on the corner so rushed out to see if he was ok and thank god he was in still all intact, shaken a bit he got on his bike and took off to catch up with us but as we didn’t turn anywhere and there were no corner markers stopped he was a bit unsure he was on the right road, he was even more unsure when parts of the bitumen road had had some fine stone put on it and his bike started sliding around a little but in the end he eventually caught up with us at the Calder hwy in Woodend where I had four corner markers waiting in a short space of about 100 meters to mark a tricky sequence of four corners close together, from there we made our way though to Tilden, Trentham, Greendale again noticing the air getting colder and the chill creeping though our layers of riding gear, eventually we arrive at Ballan hotel for lunch. Once everyone arrived we made our way into the bistro, everyone’s eyes lit up with delight as they spotted the circular glass fireplace right beside the tables we had reserved and it sure wasn’t long before everyone was huddled around to get some of the warmth back in their hands, After warming up we began ordering lunches and drinks, we had the whole bistro almost to ourselves I think there was one other couple in there, unfortunately the kitchen staff didn’t cope with 13 hungry bikers so the meals were slow coming out which was a bit annoying as I had given them ample notice and numbers before we arrived so therefore we were held up almost an hour more than intended but it did give plenty of time for everyone to warm up for the next leg of the trek. All warm again and ready to roll we headed out of Ballan turned right onto the hwy then to the freeway service centre to refuel. 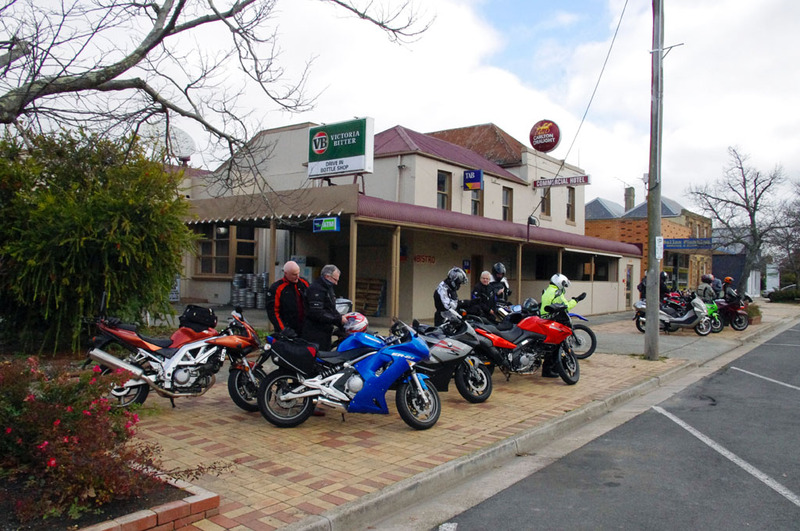 All refuelled we again headed back into Ballan but this time turning left at the hwy, a short distance down the hwy we take a right turn heading to Mt Egerton, at Mt Egerton we turned right and rode out though a few small towns again, though Gordon to Dunnstown then across to Mt Buninyong. Again we wind our way up the mountain on a very narrow slippery one way road and stop at the top for a regroup and amenities break, heading off again on the way down, just around the bend we stop right on the edge of the mountain to take in a breath taking view and a group photo opportunity before our decent back down. At the base of the Mt Buninyong we make a right turn heading back toward Mt Egerton but on a different road that takes us though Yendon, just before we reach Mt Egerton we turn off to the right taking a very long narrow road that is straight in most parts but with quite a few surprise bends, descents and climbs between flats, hills, gorges and pine plantations, the road was sealed however many sections had been repaired so a bit of swerving and lots of bumpy areas made sure you didn’t stray your eyes of the road to long but the scenery was absolutely fantastic. Arriving then at Meredith for another regroup and amenities stop a few riders were busy rearranging and checking the family jewels were still intact because of the bumpy road, luckily no one complained of anything missing or damaged, so off we went again on the final stretch of our trek taking us though some twisty and straight roads to Steiglitz, Anakie, Balliang, Eyensbury and finally in Laverton where the ride ended. Everyone gathered at my house for a quick late afternoon tea and warm up by the fire again before heading offinto the night and back to their own nest. 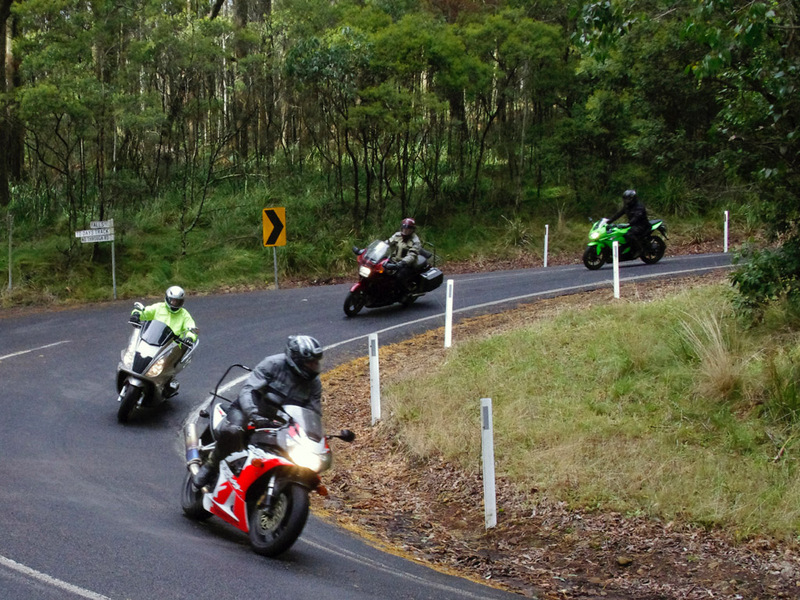 I hope everyone enjoyed the ride and took in the spectacular scenery and advantage of some of the very long secluded stretches of straight road to open up their bikes. A big thank you goes to all the guys that came along, you all done a fantastic job marking the many corners and ensuring no one got lost and a special thank you to Brett our dedicated photographer and John C for the map attached.